In 1954, along the dusty Madera, California fields surrounding a little home church, a young Catholic organizer with Saul Alinsky’s Community Service Organization (CSO) worked alongside the town’s Pentecostals. Chávez also remembered how the power of music and singing impressed him: “I think that’s where I got the idea of singing at the meetings. That was one of the first things we did when I started the Union. And it was hard for me because I can’t carry a tune.” Chávez remembered being one of few Catholics who crossed denominational lines to attend Protestant services. The power of music, in Chávez’ view, extended beyond the immediate sensory experience. “Everybody was happy. They all were singing. These people were really committed in their beliefs, and this made them sing and clap and participate,” he wrote in La Causa (116). By 1966, while organizing the newly formed United Farm Workers (UFW), Chávez drew from Apostolic-inspired coritos (little hymns) like “Alabaré” and “No nos moverán,” in order to create canciones of the struggle and farmworker corridos. Simultaneously, he reached into his own Catholic tradition to invoke the power and imagery of La Virgen de Guadalupe: together with the eagle, they eventually became symbols of the UFW and el movimiento. Etched indelibly into the psyche of the Chicano movement were La Virgen and el aguila but it was Apostolic-Pentecostals who taught Chávez priceless lessons about religion, song and the loyalty of the poor. Poor folk, immigrant non-English-speaking Apostólica/o farmworkers of Madera stood with Chávez in the 1950s, providing him with unconditional support he would later gladly acknowledge. “For several years the Protestants, although a minority, were in control of the CSO and provided some excellent leadership.” he continued. At a time when local Catholic clergy shut him out of his own church, poor Apostólico farmworkers opened their doors to his organizing. 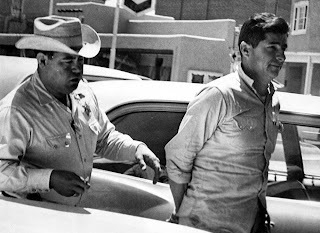 “The priest also red-baited us, and that issue turned out to be a major one in Madera.” Chávez remembered the wrenching episode as an illuminating one: “It taught me a lesson I never forgot.” Catholic clergy’s fear of communism combined with a fearful and self-interested middle-class Mexican American leadership to nearly shut down Chávez’s nascent movement. “None of the old officers were farm workers… These guys were really under a lot of pressure from their employers… we elected nothing but farm workers, and we came up with an all Protestant board. Most of them didn’t know how to speak English. Then we started moving. That was one of the best CSOs we had,” Chávez continues. “Jerry Torres here in Madera has helped me a lot. He has attended every house meeting with me. He has lined up about six meetings at his house. Not only that, but he has resigned from the Owls Club and the Auto Races. He is a race car driver and he is all out for the C.S.O.” (Reports of Cesar Chávez July 16, 1954, Wayne State University Archives of Labor and Urban Affairs and University Archives, The Fred Ross Senior Collection Box 1 Folder 2). Chávez proudly recalls in La Causa, “I radicalized that chapter more than any other chapter, I guess, in that short period of time. They [Apostólicos] weren’t afraid to take on the police or the immigration service. They [las Apostólicas] weren’t afraid to fight for their rights.” Bereft of support from local religious and community leaders, the young organizer turned to Apostolic Pastor Mariano Marín, his daughter Sally, who became Chávez’ first Corresponding Secretary (as documented at Wayne State University Archives of Labor and Urban Affairs and University Archives, The United Farmworkers Office of the President Collections Part I Box 2, Folder 6) and the parishioners of this little Madera Apostolic Church support the C.S.O. and became its Executive leadership. “Jerry Torres, Connie Díaz, Tony Gonzalez, Jamie Rodríguez, Sarah B. López, Elbert S. (unclear), Lupe Vizcarra, Miriam García, Lupe Gutierrez, Annie Samora, Joe G. Samora, Martin Padilla, May Arias, Carmen Reyna, Benny Garibay” (Wayne State University Archives of Labor and Urban Affairs and University Archives, The United Farmworkers Office of the President Collections Part I Box 2, Folder 5). The spiritual tone of nonviolence, peaceful actions and spiritual fasting became footprints of Chávez influences from the local Apostolic faithful (a pacifist group) of Madera to Dr. Martin Luther King, Gandhi and Jesus. Chávez’ organizing legacy lived on inspired by religion. If according to Marxist theory, religion is the opium of masses, to Cesar and to poor Apostolic-Pentecostal farmworkers, religion was a tonic for revolution and to mobilize masses in song in support of the national boycott y la huelga. In true Pentecostal form, Rev. Tijerina’s fiery sermons brought down the house, a fire from heaven, to mobilize the masses on earth. Tijerina’s catalytic speaking style sparked the imagination of people. From Tierra Amarilla, New Mexico and dusty farmworker fields of Madera to urban centers like Denver and the concrete rivers of East L.A., spiritual metaphors were injected into political teachings inciting non-violent actions, directed violently at and aggressively against power and authority. Silent sacred passive images of la Virgen de Guadalupe drove and led Chicano Power marches and hippie farmworker processions towards centers of power like Sacramento. If the serene and tranquil image of La Virgen became a symbol of peace guaranteeing protection for the masses, spiritual Apostolic-Pentecostal worship songs inspired the revolution. It’s important to note that of the “Four Horsemen of the Chicano Movement,” only Cesar Chávez was Catholic. He was however, deeply sympathetic and grateful to Protestants. Corky González grew up Presbyterian in Colorado. Tijerina was a Pentecostal-trained minister with the Assemblies of God in Texas, before arriving in New Mexico. José Angel Gutierrez was the only leader who grew up in a non-religious home. Two of the four were Protestant yet, “In [the] construction of Chicanismo, the cultural ideology of the Chicano Movement, Roman Catholicism provided an assumed ritual and sacred canopy for the community,” Bustos tell us. There is no thorough analysis of the religious background of the movement’s non-Catholic leadership nor of the Apostolic influence on a young Chávez in Madera. Tijerina converted to Pentecostalism in his teens, in spite of being raised by a devout Catholic mother. Alurista, the famed “Poet Laureate of Aztlan” provided a preamble with spiritual undertones for the movement with “El Plan Espiritual de Aztlan,” a key early document adopted organically as a sort of manifesto. Alurista grew up Catholic but also studied religion and understood its power. Significant, at least to Chávez and the West Coast arm of the movement, was the experienced wisdom of Humberto Noé “Bert” Corona, the protestant-born Mexican-American civil rights leader and labor organizer, also known as “El Viejo.” Corona played a key and critical role in evangelizing to LA’s urban population and nascent Chicano leadership about the need to support and organize undocumented immigrants. He was thus successful in converting Chavez’ mind and position with respect to immigrant rights. It is no secret that Chavez had initially kept his distance from advocacy on their behalf due to their role as farmworkers who had, for economic survival, crossed the picket line during the grape strikes. Corona, like the Protestants of Madera, was also unafraid to organize undocumented immigrants and women’s leadership; he knew it was of vital importance for labor and the movement. “Religion, specifically Protestantism, was also very significant in my socialization and in influencing my own later political activity,” Corona tells author Mario T. Garcia in Memories of Chicano History: The Life and Narrative of Bert Corona. At the center of Corona’s life influence were two powerful Protestant religious women leaders: his Congregationalist mother and grandmother. As leaders who were of primary importance to “El Viejo,” the both directed regional and national church gatherings for women. Corona’s Protestant roots deep in the Congregational Church taught him lessons about organizing, lessons he shared with Chávez and other young movimiento leaders. Studies by Chicano movement scholars fall short insofar as they fail to recognize, much less critically analyze, the complexity and depth of religion and spirituality within U.S. Chicano history. A great majority of the texts on the subject are forged and influenced by outdated Marxist theoretical frameworks with respect to religion, faith and spirituality. The absence of serious analysis on political power, agency and spirituality negate the formative years of the Chicana/o movement’s leaders, their complex sociopolitical motivations and heavenly visions of earthly revolutions. Religion played an enormous role in the formation of a leadership that drew much of its early support from real grassroots laity.